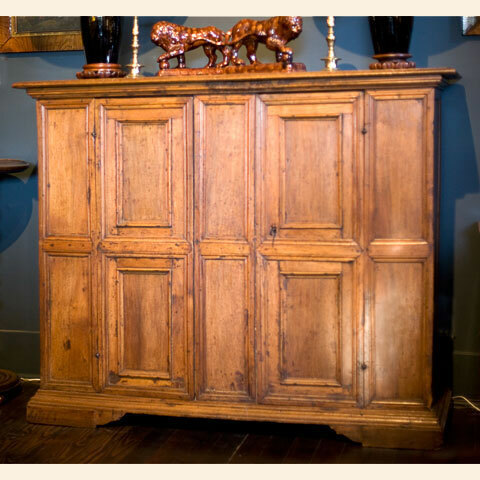 17th C - circa 1680 - Italian walnut credenza or cabinet. Northern Italian - Tuscany, Chianti - Siena. Molded top over paneled sides. Two doors on front. Raised bracket feet. Old surface - oxidized and stained. Detail photo shows age of piece. Old replacements to some molding. Partial replacements to plinth, base and bracket feet. Worming (inactive) repairs. 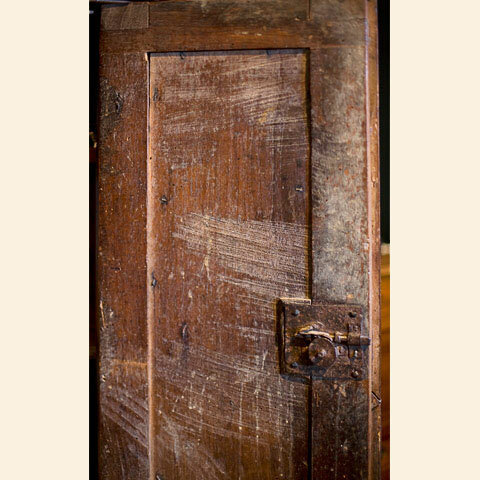 The interior of the doors and back boards show an impressive aged texture. T. Reggiardo Antiques, located in the Presidio Heights neighborhood of San Francisco since 1998, specializes in 18th and 19th century English and Continental - Italian, French, German, Dutch, Swedish - furniture and works of art. The shop also carries select 20th century pieces of furniture and art. Featured styles include Anglo-Indian, Baroque, Biedermeier, Chippendale, Empire, Expressionist, Folk, Georgian, Mieji, Modern, Neoclassic, Queen Anne, Regency, and Rococo. The collection includes armories, benches, bookcases, bronzes, carpets, ceramics, chairs, clocks, commodes, desks, glass, ivory, lighting such as lamps and chandeliers, marquetry, mirrors, paintings, porcelain, silver, tables, tapestries and many small objets d'art. The owner, Tom Reggiardo, has been in the antiques trade for more than 30 years. He is a member of the Antiques Dealers Association of California, which was founded in 1924 and whose members pledge "integrity and fairness in the buying and selling of antiques." All inquires are welcome, whether about pieces on this site or other items you may be looking for. Photography by Tom Wacha of Stella Studio.